Getting Started? How do we find the data on mobile web users? Meet Jenny. She’s a seasoned reporter who has recently delved into the world of web audience analytics and discovered a couple of things. First, Jenny found that the methods for measuring audience behavior are quite easy to learn. Second, she realized that she has a talent for slicing and dicing the data (“This isn’t just for the SEO guy and the marketing people.”) Jenny has become the go-to person in her newsroom for all things related to digital audiences. Jenny learned the basics of web audience measurement using Google Analytics (see Web Metrics: Basics for Journalists). In particular, she mastered the pathways to find basic metrics such as pageviews, sessions or visits and users or visitors. A PAGEVIEW is a count of each time someone views a page by any method, such as clicking on a link, typing in a URL, or refreshing a page. A SESSION, or visit, is a series of pageviews in a single interaction with a website. This metric is shown by default in most charts in Google Analytics. Now, Jenny is ready to ask more specific questions about the audiences who visit her news organization’s site using their smartphones and tablets — at stores and restaurants, on the subway, walking, talking — anywhere. Mobile users are obviously an important audience segment. How can Jenny find out more about them using web metrics? 1. Jenny logs into Google Analytics, and chooses the REPORTING navigation link on the upper left of the login page. 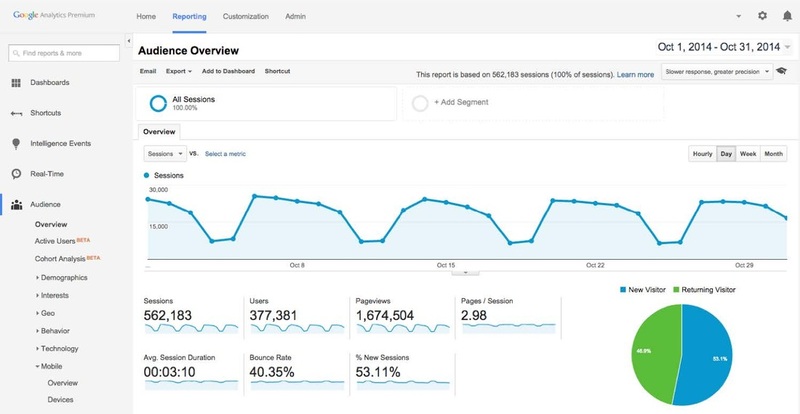 That opens up the standard Audience Overview navigation screen that has a graph on the page that measures all sessions for the site over a 30-day span. (This is the default time span in Google Analytics and can be adjusted by clicking on the date range on the upper right.) All other data on the Audience Overview screen, such as pageviews and users, represent traffic for all sessions. Since Jenny wants to find out information about sessions or visits from mobile users, she checks the options in the left menu bar under AUDIENCE. She sees many choices, including MOBILE. 2. Jenny selects Mobile > Overview. A new table appears underneath the graph, which breaks out the traffic to her website into three device types: desktop, mobile, and tablet. In the table, Jenny can see and compare how many sessions and users came from smartphones and tablets in relation to the totals for her website. She notices that an important metric called BOUNCE RATE — which measures how many users viewed one story and left — was highest among mobile users, at 52 percent, and 17 points higher than the bounce rate for desktop users (35 percent). This means about half of the sessions from mobile users left the site after seeing one page. Jenny suspected that this would be the case, since most people she knows use their smartphones to multitask and don’t spend much time leisure reading. 3. The table and graph are helpful, but Jenny wants a more visual depiction to show to her colleagues. She goes back to the table and clicks on the small circular icon on the upper right side. The pie chart more clearly shows that mobile users make up a substantial portion of overall visitors to Jenny’s website.